The most significant date for our country is December 16, 1991. On this day, a law on Kazakhstan's independence was adopted, which announced the emergence of a new sovereign state on the world map. This is of great importance a planetary event in the life of the multinational peoples of our country. Sovereignty of Kazakhstan is confirmed by the fact of its political and economic independence. Political independence is embodied in the Constitution of the Republic, economic is confirmed by the development of the economy of modern Kazakhstan, which in the post-Soviet space is a state with a rising economy, with a growing social standard of living for people. This demonstrates, shows that any people is capable of sovereignty and independent development. And such development of the state depends not only on politics and economy, but also on other, essential and essential foundations, among which, first of all, spiritual, cultural, originate in the gray ages. Like all world, Kazakh culture begins with a mythological, the beginning of which refers to the times of the Andronov, Begazy - Dandybaev cultures. The essential feature of this period was the first major social division of labor, the selection of cattle-breeding tribes. Cattle breeding begins to act as the dominant, predominant type of livelihood of our ancestors. The nomadic, nomadic way of life influenced the spiritual culture of the Kazakhs, which was cosmocentric in its content. Nature for the nomad was an absolute and eternal beginning. Man obeyed this nature, it acted as the universe, which dictates to man the forms and ways of his being. The immediate proximity of the Kazakhs to nature was expressed in the understanding of time, space, the inner world of man, the meaning of his existence, his morality. This forms the national image of the world, the world outlook, which is the identity of the spiritual culture of the people. A special role in the life of nomads was played by the concept of "way" and "road". It meant not only a physical spatial dimension, but also a comprehensive worldview concept of life, fate as a path, the principle of behavior, etc. "Man must move, because the sun, the moon, the stars, the animals, the fish - everything moves, only the earth and the dead remain in place!". The whole life of a nomad is a path, a movement that is measured by time cycles, horse runs. Since time immemorial, nomads say "Zholyn bolsyn!" (Safe trip! ), "Zhol ursyn" (Let the road hit you), etc. The space of the yurt was represented to the nomad by the celestial vault, turned over to the ground and including it in itself. Yurt had a circular shape and it is not accidental. The circle for the Kazakh had a symbolic character. If we take all the objects of everyday life, they had a circular shape - shanyrak, hearth, and even food - cakes, baursaks. Shamans also performed a full circle in the treatment of the patient. And from here the most affectionate word among the Kazakhs was the word ainalaiyn, the content of which meant: I bypass you and accept all your illnesses, all your failures, sadness, sorrows, that is, I am not indifferent, but I am involved in you. According to the ideas of the Kazakhs, the Cosmos is structured, hierarchical levels were distinguished in it, the uppermost of which was the Sky - the abode of Tengri and the kind, light spirits, the middle - the world of man, and the lower, Tartarus - the realm of the dead, the kingdom of darkness. Each of these worlds corresponded to a particular kind of animal. The symbol of the higher world was a horse, an earthly, material sheep, and the otherworldly, the world of the dead - a cow. Uniting all animals, and hence the worlds, the beginning was a camel. The uppermost totem, the sacred animal of the Kazakhs was the wolf. The deification, the sacralization of animals, formed the basis of the "animal style" created by the steppe of art, imprinted both in poetry and in rock drawings, in works of applied and ornamental art. Kazakhs were great astronomers, astrologers. They were perfectly oriented in the starry sky. They believed in the influence of the stars on human happiness. A happy man, protected by fate, they called "a man with a star." A similar understanding of the mythological anomaly was historically the first view of the Kazakhs, which had a long character of existence. The spiritual ideological basis of the Kazakh people was Tengrianism. The supreme deity was Tengri, the habitat of which was considered to be Heaven. Tengri - active, omnipotent, omniscient, wise. He is the personification of harmony, order in the Universum. Harmony is a violation of death. With the blessing of Tengri, everything appeared, including man. It acts as a tiny synthesis of the Universum, a microcosm. In the pantheon of the Tengrian deities an important role was played by the deity of the terrestrial world - ZherSu, the female deity Umai, "Ala atty zhol taniri" (God of the way on the peg horse) and "Kara atty zhol taniri" (God of the way on a black horse) and others. Ancient Türks believed in the existence of good and evil spirits. The spirits of the ancestors to whom they worshiped were kind, the sacrifices were offered to them, and the evil spirits were Albasty, zhyn, zheztyrnak, etc. frightened off by sparks, whirling, talismans, etc. They also resorted to the help of shamans (baqsy), whose authority was indisputable, their power consisted in the fact that they entered into direct contacts, direct communication not only with spirits - good and evil, but with Tengri himself. One of the first shamans, their patron is Korkyt-ata. So, tengrinism, shamanism combined with nomadic way of life formed the specificity of Kazakh culture, which first of all consisted in openness, integrity, universality, cosmic and reverence for nature, life. And this culture, spirituality influenced all its subsequent development, especially at the stages of transition from tribal relations to state ones. One of the first state formations in the territory of Kazakhstan was Uysun. The main occupation of the inhabitants of this state was nomadic cattle breeding. The sedentary population was engaged in various crafts, trade and not unsuccessfully. The extant material monuments of Uyssun culture show that they were fine artists, jewelers, sculptors, architects. They were founded powerful cities-fortresses Chigu, Zhetysu, Biten. The successors of the Uysuns are the powerful state of the Turkic Kaganate, which existed for several centuries and the less durable state of Karluk, created on the eve of the Arab expansion of the Kazakh steppes. The Arab yoke represented by the Karakhanid state contributed to the spiritual development of the Kazakh people. It was at this time that the environment that generated such personalities as Al Farabi, Zhussup Balasaguni, Khoja Ahmet Yasaui, etc. was created. Their teaching was a stage, an epoch in the development of Kazakh Muslim spirituality, of science. The nomadic, nomadic way of life continues to be the leading trend in the life of Kazakhs during this period. It is thanks to this activity that our ancestors-nomads mastered in the fierce battles the vast expanses of the steppes, in which we live today. A cruel test for our people was the invasion of the Kazakh steppe by Mongolian nomads who for several centuries stopped the natural development of statehood among the Kazakhs. The Mongol conquests were accompanied by terrible ruin, devastation, cruelty, which was reflected in the monuments of folk art of those times in zhyrau, in heroic epics, various legends. The year 1461 was a historical year for our people. At this time, there is a division of Maverannahr Khurasan, which laid the foundation for the process of creating Kazakh Khanate, which stretched over the vast expanses of Desht-i-Kipchak. This process was accompanied by the design of Kazakhs in the ethnos (nation) and the formation of their own mentality. Of course, all the conquests could not pass without a trace. Thus, the ethnogenetic heirs of our ancestors-nomads became Scythians, Huns, Oguzes, Saks, Uyssuns, Kangly, Kipchaks, Turks, and Arabs, Mongols, each of which introduced certain morphological changes in the biopsycho-ethnic type of Kazakh nationality. The socio - political, religious and spiritual outline of the life of Kazakhstan of that era gives rise to a pleiad of thinkers, poets, like Asan Kaigy, Shalkiyz zhyrau, Bazar zhyrau, Yskhak Uali and other personalities of planetary scale. They, being marginal personalities, were able to preserve and continue the spiritual culture of the people. They were all wise men - zhyrau, akyns and their ideas were impromptu in singing, in a peculiar form - aitys - poetic dispensations, sheshe - aphoristic speeches, undeu - poetic addresses, arnau and maktau - poetic messages and odes, tolgau - edifying philosophical reflections, term - edifying poems, etc., through which the features of the spiritual and cultural life of the people came to us, their solution of the problems of the existence of man and the world in a specific steppe interpretation. The social ideal of Asan Kaigy was the state of Zheruyk, where prosperity and happiness flourish. The living conditions in it are most favorable for nomads, carefree days, green meadows, rich pastures, abundance of water, "larks peacefully nest on the back of a sheep". People live in a large community, in full harmony with their nature. They listen to the advice of aksakals, who are generators and transformers of knowledge, bearers of universal human values, centuries-old traditions and customs of their ancestors. Therefore in Zheruyik people appreciate and love aksakals. Goodness and Justice triumph everywhere. In this society there is no room for evil and other bad vices of man. In search of Zheruyk, the promised land, Asan Kaigy traveled a lot on his fast-moving camel. But everywhere he encountered evil, cruelty, violence. He sees the roots of this evil first of all in the ignorance of the people, who shared them, contrasted them according to generic and other grounds. The creative work of Bukhar-Zhyrau Kalkaman uly (1693 - 1787), adviser to Ablai Khan, who made an essential contribution to the unification of the three Kazakh clans and the creation of a strong centralized Kazakh state, is permeated with deep sympathy for the suffering of the people. His work falls for a time, characterized in the historical literature as a time of ultra-high tension and brutal trials, a year of "great disasters" and hard times. Dzhungar raids, the Chinese have become frequent, especially tragic for the Kazakhs was 1723 year. 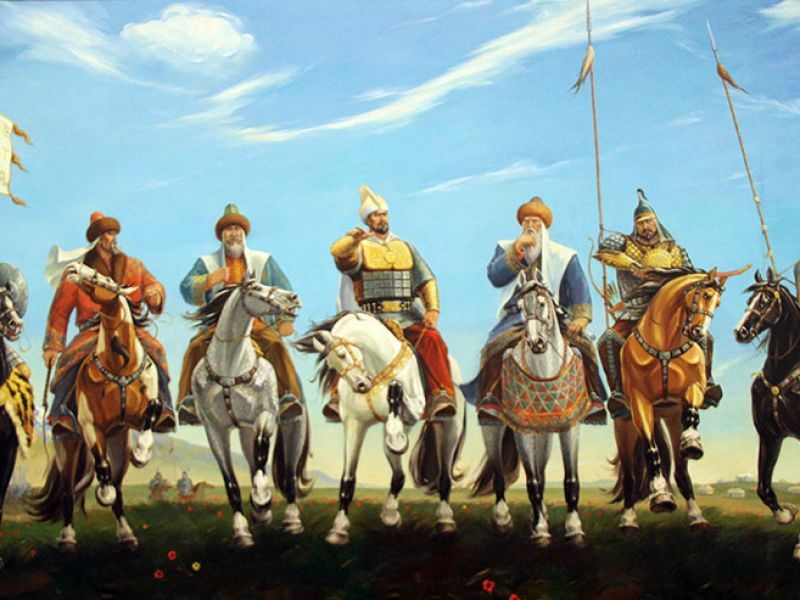 In the following 1724-1725 Dzhungars were destroyed Turkestan - the spiritual home of the Kazakhs, the birthplace of the great Khoja Ahmet Yasaui and the city of Tashkent. Dzhungars as a tornado flew to the settlements of the Kazakh Khanate, devastated, swept away, destroyed all life on its way. Before the Kazakhs, the issue of their further existence as an ethnos was sharply raised. In these circumstances, the issue of the adoption of Russian reign was particularly acute. And Ablai Khan takes the only right decision in those conditions - he turns to Russia for help. Nevertheless, Kazakhstan, being on the rights of the Russian colony, found itself in a period of historical backwardness. The huge Kazakh steppe open spaces became easy prey on the path of predatory strategic interests of the Russian Empire. This empire destroyed the historically formed national system of governance, violated the ethnoterritorial integrity, tore up all the old traditional tribal ties that strengthened the unity of the people. And the Kazakhs in their native land found themselves in the role of a powerless stranger. But the Kazakh people did not want to put up with such a fate. And this marked the beginning of a series of major uprisings of the late ХYIII - the beginning of the nineteenth centuries under the leadership of Syrym Datuly, Isatay Taimanuly and Makhambet Otemisuly, the movement of Kenesary Kasymov. Unfortunately, all these speeches were brutally suppressed by the tsarist autocracy. At this stage, a new spirituality was formed, based on mythological culture, pre-Islamic beliefs and Islam. The main goal of their teachings was the thinkers of this era - Ayaz bi, Zhirenshe sheshen, Kaztugan, Dospambet, Margaska, Abay Kunanbayev, Shakarim Kudaiberdiyev and many others saw in the perfection of man, his soul. They sang the love of God as a love for nature, for the world around them. The main idea of ​​their creativity was that everything in the Universum is completely and interrelated, starting from the simplest and ending with the human mind. The emergence of a new, sedentary civilization coincided with the entry of Kazakhstan into the Soviet Union. Great expectations of the Kazakh people were associated with the creation of the Soviet state. However, the USSR, with all its positive moments for a number of outlying republics, came from a position of total internationalism, while ignoring national peculiarities. At the beginning of the 20th century, thanks to the activities of the "Alash" movement, Kazakhstan gained the opportunity to gain independence, breakthrough into the big world. Against the activities of "Alash" were the Bolsheviks, who, having won a civil war, liquidated "Alash" as a movement, and its leaders subjected to repression. In the early 1990s, the Soviet totalitarian system collapsed and Kazakhstan takes the path of independence, acquires genuine independence, sovereignty. And today we can say that Kazakhstan, relying on such a strong historical spiritual and cultural basis, took place as an independent state, that the level of its economic and political state is such that it ensures its independence, its entry into the world community at the level of many developed countries of the world.